Camilo Gomez is the Director of Business Development at PSL, Colombia’s leading software development company. But in Colombia, where the government has yet to legitimize cryptocurrencies, blockchain has taken off in an entirely different way. The country’s software development companies have been the ones to lead the charge by exploring the possibilities of blockchain and its potential applications within multiple industries, and building innovative solutions for outsourcing clients in the United States and elsewhere. With a number of stakeholders on board, the country is now making a huge push to use blockchain as a way to strengthen the country’s position as an IT powerhouse in the region, and give software outsourcing clients a reason to take notice more than ever. The country’s IT industry generated revenues of 13.5 trillion Colombian pesos (USD 4.74 billion) in 2016, and, among its many achievements, the country has successfully made strides in closing the technology adoption gap between large enterprises and smaller companies in recent years. Take the implementation of mature technologies as an example: According to IT ministry Mintic’s 2017 digital economy survey, 70.7% of large corporations were implementing things like broadband and software applications in 2015, compared to 35% of medium-sized companies and 21% of smaller players. Two years later, those same figures stood at 76%, 60%, and 52%, respectively, showing rapid growth in adoption – good indicators that a similar pattern could occur with emerging technologies. Where does Colombia’s blockchain progression stand today? Blockchain is still at a relatively nascent stage in Colombia, despite government support and corporate buy-in. Consequently, because many of the country’s blockchain initiatives are still in the whitepaper or project stages, it remains a challenge for Colombian businesses, especially at the enterprise level, to adopt the technology without established methods or processes. This is evident in the numbers, too. The digital economy survey indicates that at the end of 2017 only 1.6% of the nation’s companies had implemented the technology. Larger companies are spearheading the adoption at 5.9%, while the use of the technology is below 2% in smaller enterprises. In terms of industries, the financial sector recorded an adoption level of 6.7%, the highest in the country, followed by the transport sector at 5%. Nevertheless, this hasn’t stopped a number of major institutions, such as the country’s banks, from exploring how they can best leverage the technology. For example, the central bank Banco de la República recently inked an agreement to explore distributed ledger technology, and the country’s largest bank, Bancolombia is already using an electronic invoicing mechanism based on blockchain technology to manage and store encrypted information – a solution that was developed in Colombia. In the transport and logistics segment, technology giant IBM partnered with a Colombian business solutions provider to deploy a blockchain-based solution. The system is built on a mix of DLT, an internet of things (IoT) platform paired with artificial intelligence, and cloud infrastructure. The companies’ goal is to leverage blockchain’s immutable process recording capabilities to eliminate human error and avoid delays in the supply chain. The system will be supported by the installation of IoT devices in cargo vehicles so they can exchange information with the blockchain network in real time – again, a product of Colombian innovation. According to Colombia’s National Administrative Department of Statistics, the US was the largest destination for Colombian software and IT products in 2017, with about 35% of the country’s IT exports being shipped there. Software association Fedesoft’s president, Paola Restrepo, has stated that Colombia’s competitive labor costs and high-quality products are attractive features for clients in the US. However, the challenges the country’s businesses will first have to overcome is training enough high-level talent and helping developers gain the necessary experience to keep up with this growing foreign demand. PSL has seen the potential first-hand through its work on a blockchain pilot with a San Francisco-based client testing multiple solutions, including Hyperledger Fabric and a Private Ethereum Blockchain instance. Based on PSL’s perspective, there has been significant interest from the US market for Blockchain capabilities delivered from a “nearshore” outsourcing model that Colombia can capitalize on. Colombia’s newly inaugurated president, Iván Duque, has expressed interest in the development of DLT in the country, as he believes it has the potential to enhance transparency in public contracts, among other benefits. As such, the government is pushing the development of DLT or Blockchain initiatives by organizing events aimed at disseminating information on the potential of this technology, as well as supporting startups in developing applications and identifying challenges. The city government of Bogota also launched a pilot program in a few schools in collaboration with innovation center ViveLab, using distributed ledger technology to record votes in student elections. The small-scale exercise is just a small step in the country’s ambitious goal to digitize its electoral processes. Tovar has stated that using blockchain technology in the ballots could result in savings of up to 1.3 billion Colombian pesos and expects the technology to be perfected within three years. Colombia’s proven experience in the software industry, combined with the government’s interest in developing and implementing blockchain applications and the passion of its technical workforce, has provided a strong foundation for the advancement of DLT. 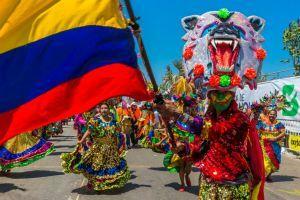 With pilot programs aimed at the public and private sectors already in place, Colombia is well on its way to making blockchain another core strength of the country’s IT outsourcing providers.